Snake plants (or mother-in-law's tongue) are one of the most popular and hardy houseplants. An architectural species, it features stiff, upright leaves that range from one to eight feet tall depending on the variety. Snake plants usually have green banded leaves, while the variety called mother-in-law's tongue typically features a yellow border. Sansevieria trifasciata is a member of the Asparagacea family—a relative of garden asparagus. Sansevieria was first cultivated in China and kept as a treasured houseplant because it was believed the eight gods bestowed their virtues (long life, prosperity, intelligence, beauty, art, poetry, health, and strength) upon those who grew the snake plant. Sansevieria also is among several plants chosen by NASA for a study on how plants can be used for air purification and to combat "sick building syndrome." 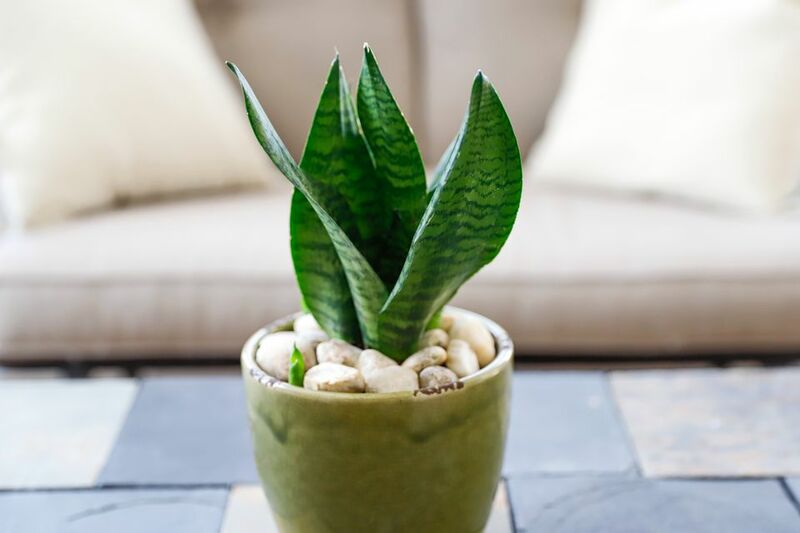 According to joint studies run by the Department of Horticulture at the University of Georgia and the Institute for Environmental Research at Yonsei University in Seoul, Korea, Sansevieria has a demonstrated ability to remove formaldehyde and benzene from the air. Sansevieria is easy to grow and nearly indestructible. Snake plant will thrive in either very bright light or almost dark corners of the house. An ideal container plant, it is excellent in a grouping and will grow equally well on the floor or on tabletop displays. These plants are also drought resistant. There are two low-growing varieties, but these are rarely seen in garden centers. Although they are very forgiving, Sansevieria plants prefer indirect but steady light with some direct sun. They can adapt to full sun conditions and will also survive quite dim situations. Sansevieria plants prefer a loose, well-drained potting mix. This plant will do well in sandier soils. Pick a potting media low in peat, which eventually packs and refuses to re-hydrate or drain properly. An all-purpose cactus potting soil is a good choice. Let the soil dry between waterings. During winter, reduce watering to monthly, or whenever the soil is dry to the touch. Err on the side of underwatering with a snake plant; too much water can kill the plant. This plant prefers warm conditions and will suffer if exposed to temperatures below 50 degrees Fahrenheit. Set the snake plant in a place where it will be protected from drafts. A temperature range between 70 and 90 degrees is best. Feed with a mild cactus fertilizer during the growing season or a balanced liquid slow-release (10-10-10 fertilizer) diluted to half-strength. Do not fertilize in the winter. When potting, choose a sturdy material as strong roots can easily crack and break weak pots. Snake plants are rapid growers and may need repotting or dividing annually. Repot these plants in the spring. When repotting, always use fresh potting soil. Sansevieria plants can be divided easily during repotting. Alternatively, new shoots that emerge from the soil as spikes can be taken and potted independently. They are rapid growers once established. Cuttings can also be taken, but it is much easier to rely on division. Sansevieria trifasciata 'Hahnii' (bird's nest snake plant) grows to only about six inches tall. Its clusters of leaves form a cluster resembling a bird's nest. Sansevieria cylindrica (cylinder snake plant) has round, stiff leaves that can reach several feet in length. The leaves arch outward from a central crown. Sansevieria trifasciata 'Laurentii' (variegated snake plant) has creamy yellow leaf margins. To propagate this plant, it must be divided rather than propagated from leaf cuttings. Sansevieria trifasciata 'Twist' has twisted leaves that are striped horizontally with yellow variegated edges. It grows to about 14 inches tall. Sansevieria trifasciata 'Bantel’s Sensation' grows to around three feet tall and has narrow leaves with white vertical stripes. Sansevieria desertii, sometimes called rhino grass, grows to around 12 inches with succulent red-tinted leaves. Snake plant is moderately toxic to people, dogs, and cats. If they ingest the plant, humans may suffer short-term symptoms including mouth pain, salivation, and some nausea. In rare instances, it can produce a dermatological reaction but is mainly toxic only if ingested. In cats and dogs, ingestion can cause excessive salivation, pain, nausea, vomiting, and diarrhea.